Before the ‘70s, David Bowie did not find much commercial success. He recorded a couple albums that drew some attention in the United Kingdom but his obscure, psychedelic style failed to distinguish itself from popular music of the decade. David Bowie’s musical career took off in 1972, when he departed from his previous work and debuted Ziggy Stardust for the first time. Ziggy was Bowie’s first and most popular alternate persona. Bowie died his hair bright red, applied makeup to his face and donned a colorful, striking costume. The first show of the Ziggy Stardust tour was on February 10th, 1972 at Toby Jug Pub in Tolworth, England. The show was immensely successful and Bowie was launched to stardom in a very short period of time. Ziggy Stardust was a spectacle that had never been seen before in Rock music. Naturally, Bowie also attracted a lot of attention from conservative groups that scorned his sexual music and feminine appearance. However, music biographer, David Buckley, wrote that Bowie’s musical style was, “unique—its influence lasted longer and has been more creative than perhaps almost any other force within pop fandom” (Buckley 135-36). Though Bowie would develop other styles and personas in the following years, none would ever be as popular or influential as Ziggy Stardust. Ziggy confused popular representations of gender and sexuality, often combining elements from different identities and harboring apparent internal contradictions. Ziggy was slender, he wore jewelry and makeup, and he donned costumes of bright colors. Yet at the same time, he was adored by millions of teen girls as an object of sexual desire. His concerts were overtly sexual in nature, often intended to generate shock from the audience. He came out as gay in the early seventies while still married to a woman (whom he divorced nearly a decade later). Stylistically, David Bowie has been called a ‘Dandy Diva’. Andrea Fontenot wrote that, “the fusion of dandy and diva entails the highly public performance of self-conscious androgynous indeterminacy as style. The dandy diva’s modus operandi is to recycle and reinvent the sartorial signifiers of another era’s and another gender’s dandiness in ways that signal an uncanny combination of being ahead of one’s time and outmoded” (Fontenot 166). 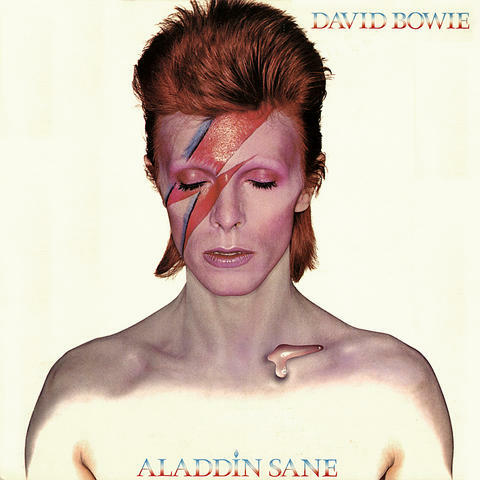 Bowie borrowed from popular cultural representations both in music and fashion, as well as popular gender and sexual norms, reappropriating them through his own image. “homosexuality and, by extension, heterosexuality are relatively recent inventions in Western culture, rather than transhistorical or “natural” categories… Only in the late nineteenth century did a new understanding of sexuality emerge in which sexual acts and desires became constitutive of identity. Homosexuality as the condition, and therefore identity, of particular bodies is thus a production of that historical moment” (Somerville, 50). It followed then, that if homosexuality is an identity then it must have a physical basis. Eugenicists combined scientific inquiries with normative judgments and a notion of biological determinism to create conclusions that were not only biased but scientifically unsustainable. These conclusions were usually racist, misogynistic, and classist in addition to homophobic. The “scientific” investigations into the bodily signifiers of sexual identity continued well into the middle of the 20th century. In her paper on 20th century positive eugenics, “Marriage is Not Complete without Children,” (University of California Press) Wendy Kline details many of these studies within the biological and psychological communities. One very influential attempt at locating sexuality within specific bodies comes from Lewis Terman. Previously, Terman had produced the first test of individual intelligence to be used widely for eugenic purposes, the Stanford-Binet scale, which had increased the cultural importance of mental and moral “normality.” Along with Catherine Miles, Terman also created the masculinity-femininity test. Kline writes that, “by quantifying masculine and feminine traits, Terman hoped to standardize male and female behavior just as he had standardized intelligence, thereby providing a mechanism to weed out both mental and sexual ‘deviants’” (Kline 135). In this way, sexuality was perceived as a function of appropriate gendered behavior. Naturally, Terman and Miles never bothered to wonder whether their gendered signifiers were subjective and culturally coded. The test would ask questions like “are you extremely careful about your manner of dress?” Here, if you answer yes, you are given a negative score (negative interestingly corresponding with effeminate and positive with masculinity). Similarly, the test had true or false questions like “Children should be taught never to fight.” Here, a ‘true’ response signifies femininity. It is evident then, that women were considered to be passive and peaceful while men are violent and aggressive. Not only does the test suggest that homosexuality is a product of inappropriate gender expression, but there is also a tacit assumption that women are on the inferior end of the binary. Using their M-F grading scale, Terman and Miles could discern between the “healthy” heterosexual and the “inverted” homosexual. “Every peculiarity of the body has probably some corresponding significance in the mind,” wrote Edward Drinker Cope, a famous American comparative anatomist of the 20th century (Gilman, Sander 112). I wonder then, what he would have thought of David Bowie. Bowie and the larger Glam Rock movement succeeded in subverting tacit assumptions about the functions of gender and sexuality. When Bowie put on makeup and platform shoes he was raising an epistemological question, one which undermines the justification for gendered and sexual categorization – what if physical appearances don’t actually confer any knowledge about gender identity and sexual orientation? On stage, David Bowie dressed in form-fitting clothing with makeup and outrageous hair styles, all of which was meant to give him an androgynous appearance. As far as his sexuality goes, David Bowie married a woman, came out as gay, came out as bisexual, divorced his wife, claimed he was “always a closet heterosexual,” (Orlando Sentinel) and then married a woman again, in that order exactly. Ultimately, the David Bowie of the ‘70s transcended all gender and sexuality-based descriptions. We might call David Bowie feminine and be partly correct, but still fail to capture his essence. Similarly, he wasn’t quite masculine, straight, gay, or bisexual but all of them together. David Bowie’s personas embodied the inherent contradictions in gender and sexuality – contradictions that the eugenicist project sought desperately to get rid of. In this way, we might understand David Bowie’s musical career, and the larger Glam Rock movement as a rebellion against conventional accounts of gender and sexuality. By assuming multiple contradictory identities at the same time, he refused to submit to the kind of eugenicist thinking that Terman and Miles utilized in creating their M-F test. The M-F spectrum does not have the descriptive capacity to categorize Bowie effectively. Ultimately, Glam Rock proves standardized accounts of gender and sexuality to be insufficient by bringing to light their internal contradictions and cultural biases. Auslander, Philip. Performing Glam Rock: Gender and Theatricality in Popular Music. Ann Arbor, MI: University of Michigan, 2006. Print. Buckley, David. Strange Fascination: David Bowie, the Definitive Story. London: Virgin, 2001. Print. “David Bowie Calls Himself ‘A Closet Heterosexual’.” Orlando Sentinel. N.p., 30 May 1993. Web. 17 Mar. 2013. <http://articles.orlandosentinel.com/1993-05-30/news/9305300344_1_david-bowie-mick-jagger-ziggy&gt;. Fontenot, Andrea. “The Dandy Diva.” Camera Obscura: Feminism, Culture, and Media Studies23.167 (2008): 165-71. Web. Gilman, Sander. “Appropriating the Idioms of Science: The Rejection of Scientific Racism.” The Bounds of Race: Perspectives on Hegemony and Resistance. By Nancy L. Stepan. Ithaca: Cornell UP, 1991. N. pag. Print. Kline, Wendy. “ ‘Marriage is Not Complete without Children’: Positive Eugenics, 1930-­‐1960” and “Epilogue: Building a Better Family.” Building a Better Race: Gender, Sexuality, and Eugenics from the Turn of the Century to the Baby Boom. Berkeley: University of California Press, 2001. 124-­‐64. Somerville, Siobhan. “Scientific Racism and the Invention of the Homosexual Body.” Queer Studies: A Lesbian, Gay, Bisexual, and Transgender Anthology. Ed. Brett Beemyn and Mickey Eliason. New York; Long: New York University Press, 1996.